The textures are often sub-N64 quality. The framerate sure doesn't have a realistic physics engine bogging it down, as cars bounce off walls like pinballs. They spin around in circles and stop on a dime, then keep on racing. For some reason, the game's developers were so proud of this fact, they even showed it in the opening cinematic. 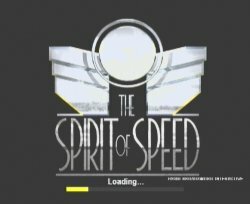 The game's literature boasts "Spirit of Speed is an attempt to recreate the actual feel of old time racing." Yet, there is no such thing present in the finished game. I can hold the accelerator down and never so much as tap the brake while taking turns at what the speedometer assures me is nearly two hundred miles per hour. I wouldn't know -- the game world moves by just as fast at 20mph as it does at 120mph. If you turn down the sound on your television, you'll have no audio cues to tell you how fast your car is traveling. Without those cues, I defy you to guess your car's current speed. There's an attempt to include pit stops so your tires and oil can get a change. However, it's so frustrating to deal with, I just quit doing it after awhile. After this, not only did I suddenly start to win races left and right, I never once had a race-threatening issue with my tires, oil, or gasoline. In fact, this whole chunk of the game is rather laughable, since you keep track of these "vital" statistics by activating a glowing blue heads-up display. I may not have paid a lot of attention in my history classes, but I'm pretty sure that this technology wasn't exactly standard issue in the Alfa Romeo P3. Speaking of statistics, you can ignore them while selecting your car. Sure, those pretty little bars claim that one car moves faster than another, or that this car has better handling than that one. Don't believe them. I drove every car in the game on the same track in the same race, one right after another. It took forever. It was grueling. I won every stinking race. I never felt one iota of difference in the way any of these cars handled. Sure, a few of them had fewer gears to shift through than others, and they all have their own dashboard graphics, but in the end they're all the same car. The majority of the gameplay takes place here. The controls are passable. But without the need to even so much as tap the brakes removed from the game, who cares if steering is adequate? I can maneuver this car so well that it's almost as if I'm on a rail. But it doesn't matter when nothing else of interest is taking place. Your hands will never be so bored holding a Dreamcast controller. The race tracks themselves are interesting only in theory. Almost all of the tracks are based on real world locales. 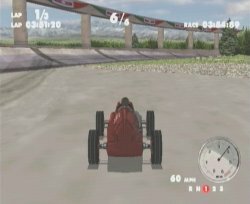 If this game were a solid simulation of what it was like to drive a 1930's era race car, then these tracks would be a blast. That's because in the real world, these tracks were death traps. 1930's cars didn't handle all that well, and when they weren't busy exploding due to being pushed too far, they were slamming into the walls on the side of the track and exploding there. However, with the crappy driving experience offered up by SOS:1937, these tracks are exercises in tediousness. When you aren't driving on an interminably long straightaway, you're moving through curves that are not nearly as challenging or dangerous as their real-world counterparts. Yawn. That brings us to the AI. I'm not really sure there is any, truth be told. In fact, I suspect the cars might be moving about the track on predetermined paths set up by some animator. All I know for sure is, these guys don't put up a fight. They drive forward in a straight line and I never once saw one wreck. I also never once saw one in a pit stop, even though the instruction manual says to get ahead in the race while your opponents are in the pit. Since there is no multiplayer (another in this game's long list of sins), I don't know who else they could be talking about. Finally (and this is just because I can't take it any more and I have to stop talking about this... this thing called SOS:1937), I must mention the rearview mirrors. The rearview mirrors are, in and of themselves, the single stupidest, most asinine, ill-conceived pile of dog poo ever to find their way into any racing game, ever. Why? Because they don't work. They're simple textures painted on. They don't reflect a damned thing. In this day and age of ridiculously powerful gaming consoles, there is absolutely no excuse whatsoever for this kind of pathetic stupidity. If your coders weren't talented enough to do a rearview mirror, cut it from the game. For the love of God, Ridge Racer, released in freakin' 1995, had working rearview mirrors! This is the twenty-first century! This is the Dreamcast, the single most powerful gaming console currently available on the North American market. Use that power, or hire some coders who can, or better yet -- don't release such a hunk of crap in the first place. Words fail. This game is terrible. Terrible isn't harsh enough. It's a hateful attack from the development team on the rest of humanity. If you absolutely must have a 1930's themed racer in your collection, then (quite unfortunately for you) this is the only game in town. Otherwise: avoid, avoid, avoid. Highs: Original idea, ok music in the shell, doesn't cost much. Lows: Everything, and I mean everything else. Other: 1 player, VMU Compatible (3 Blocks), Race Controller Compatible, Jump Pack Compatible, Arcade Stick Compatible.